Buckle up for this stellar interview. Why? Because Pat Flynn of "Smart Passive Income" fame is in the house! Pat has an amazing story. More than five years ago he was laid off from his job. That forced him to be creative and find a new way to earn money and design his life. 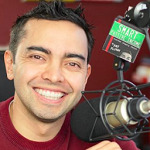 Today he has a thriving blog, podcast and speaking career - consistently earning $40,000 to $50,000 a month via affiliate commissions, product sales, and speaking.